Here are tips for how to sort laundry so that your clothes get washed in the optimum way, but without too much effort involved. But before I get into these tips, I want to explain why sorting your clothes is actually worth taking the time to do. Yes, you can just throw all your clothes together and wash them. However, not all clothes are created the same -- different fabrics, embellishments, colors, and even differences in stains and wear and tear. All of these things need to be taken into account when you wash your clothes if you want them to get as clean as possible, while also keeping them looking as good as new for as long as possible. The simple step of sorting so you wash everything optimally gets your clothes the cleanest, with the least wear and tear, keeps them less dingy from bleeding dyes, and keeps them from shrinking, pilling and snagging on other items. This saves money by making sure you don't ruin clothes or wear them out prematurely, and lets you look good longer in the process. As you sort each item of clothing you need to ask yourself some very basic questions about each item, make your decision, and then throw it into the appropriate pile. Your goal is to sort the clothing into several good sized piles where each item will be washed without too much chance of damage, excessive wear or otherwise be ruined (or ruin something else in the load). Don't go to either extreme of throwing everything together, just because, nor washing each item individually. Question 1: Can I Wash This Item With Like Colors? Every time you wash clothing some dye from it is released into the water. If you wash like colors together any dye that is released and then redeposited will be similar to what is already in the fabric, and therefore will not make the clothing look dingy. This prevents the stray red sock, for example, from turning the whole load of whites pink, for example. Very bright new clothes, and jeans and other clothes that continually release their dyes, should be washed separately, especially the first few times they are ever washed. Some people try to use a color catcher to grab the dye in the water, so they don't have to sort for this reason, however some people (such as Consumer Reports) say this doesn't work as well as sorting. The link provides more information on this topic, plus a video from Consumer Reports explaining the testing they did on popular dry grabbing products. Question 2: What Water Temperature And Cycle Should This Item Be Washed In? Just because items are similar colors doesn't mean they can be washed together. Look at each item to see how it should be washed (and later dried), based on the type of fabric, embellishments on it, and other factors. When in doubt on how to sort laundry in your pile just look at the laundry tags which will guide you on appropriate ways to wash it. 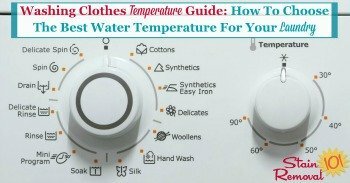 You can learn more about how to choose the best water temperature for your laundry here, in this guide. 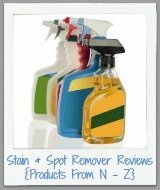 Question 3: Does This Item Need Special Stain Treatment Or Otherwise Is It Heavily Soiled? Even if you normally wash an item a certain way, with certain colors, something may have happened to it, such as a big spill or stain which means you need to treat it differently this one time, to get it clean. Before throwing it in the wash you may need to presoak it in a laundry stain remover, or wash it separately to prevent the dirt and soil from getting on all the other clothes in the wash. 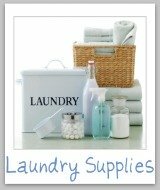 Question 4: Can I Wash A Lot Of Items Like This Together? 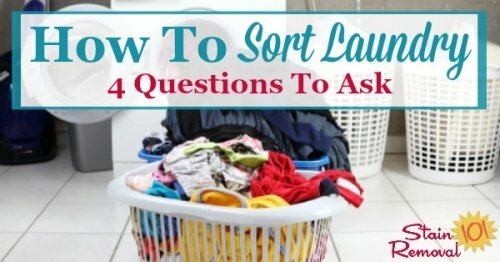 Finally, the last question to ask for how to sort laundry is whether you can wash a lot of the same type of item in the same load. There are certain types of items that are often washed together in one big load, such as all the bath towels, sheets, or kitchen towels, for example. Sorting in this way is generally pretty obvious. However, things you should also try to wash together in the same load, but that may not seem as obvious, include both socks in the pair, or tops and bottoms of matching outfits, for example, so that these items don't experience uneven fading. This prevents two "matching" socks that are different shades of faded because they weren't washed in the same load. The reason that people often say they haven't even taken the time to learn how to sort laundry is that they assume the process takes too long, and isn't worth the time investment. Yes, sorting laundry does add a bit of time up front to how long it takes to wash clothes, but you can shorten this time by sorting as you gather your clothes in laundry baskets or bags. 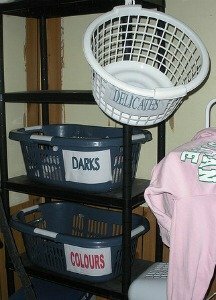 I personally use a three bag laundry sorter, but you can also designate specific bags or baskets for various sorting piles, such as in the picture to the left. If you throw the clothing into baskets or bags designed for your family's most frequently used sorting piles all you have to do when a designated basket or bag is full is dump the contents into the machine, and wash them. 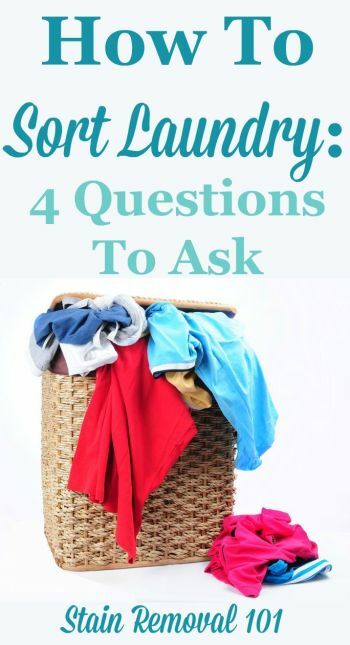 This method also helps you judge what laundry needs to be done next, and what can wait, because you can easily see which basket is fullest, and what items need to wait for a fuller load. 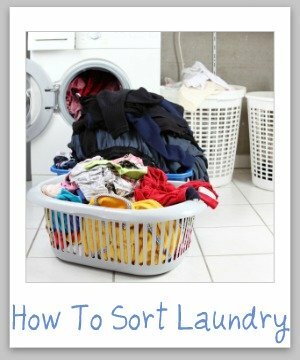 So, those are my tips and tricks for how to sort laundry. I would love for you to share your own thoughts and ideas about this topic as well. 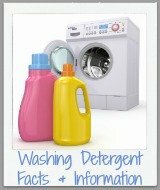 You can share your own laundry tips here. In addition, several other readers have already shared their own ideas for this task as well. You can read reader tips and tricks here.